I’m on a mission to seek and destroy! 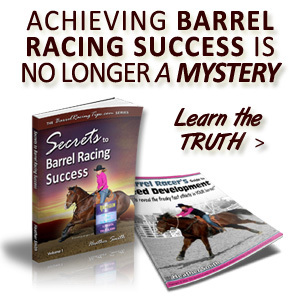 Specifically the roadblocks that are holding YOU back from achieving the barrel racing success you so deeply desire. Now let me begin by assuring you that I’m ALL for focusing on the positive, accentuating what’s going well, and for polishing up you and your horse’s pre-existing talents and skills. But I’m also a realist. I don’t want you keep riding around the arena without a realistic understanding of WHY you’re not clocking, and specifically what you need to DO to change that. I want to be brutally honest with you. I had to laugh, because while due to my overwhelming enthusiasm and purposeful positivity I can come across as almost Pollyannish, at the same time my feet are always touching the hard ground of reality. 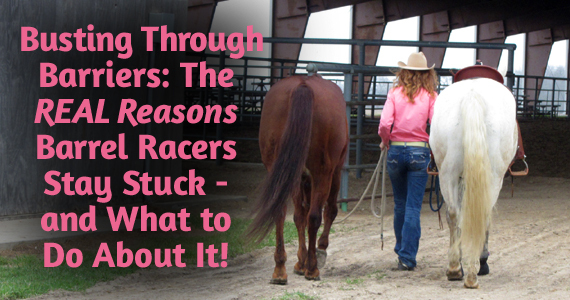 So in a realistic spirit, today I’ll be sharing FOUR of the most common, but lesser-known reasons barrel racers get off track – so you can avoid (or correct) them! The first is poorly developed, OR the complete absence of structural systems of support. Without well developed support systems, barrel racers may lack the clarity, focus, drive & determination it takes to be competitive. The truth is, that while some of what it takes to be awesome at running barrels IS hard, I’d venture to say that most of the work it requires is not necessarily hard, but does require a high degree of commitment and consistency. So often, even where there is inspiration and good intentions, there lacks follow through. Ever wonder WHY this is? What’s really underneath a seeming lack of discipline? One issue I’m aware of, is that some individuals just aren’t wired innately to be super hard driving achievement junkies. People like my husband Craig (bless his heart) are “free spirits” whose thoughts and actions seem to blow around with the changing wind. He likes visiting with the neighbors, he’s good at “stopping to smell the roses.” He sometimes starts projects without finishing them and gets easily side tracked. While being “IN the moment” is a great thing, getting lost in it can distract Craig from his goals and long term vision. They say that nature is always trying to balance itself out and that opposites attract, which I’m sure is why we ended up together! While it’s hard for him to finish things, it’s hard for me not to. My social life leaves a lot to be desired because I’m so ultra-focused on my horses, my projects, my goals, etc. As much as I love food, I have to set alarms on my phone to remind myself to eat lunch. I know what I want, so I make plans and impeccably follow through with them – sometimes to the point of exhaustion or sacrificing other areas of my life due to my intense tunnel vision. Obviously, Craig and I are both very different. Even though I happen to LOVE organization, planning, checklists and systems, and he despises them, you can see that we BOTH need them to stay on track. If Craig doesn’t have a plan and a system to remind him to follow through, he’ll forget and lose focus. If I don’t have a plan and a system, I’ll get so focused on certain details, that I’ll neglect others. Due to his innate personality characteristics, Craig brings positive qualities to the arena that I don’t – ones that I have to intentionally develop as skills, and vice versa. What I’m getting to is that one REAL reason people “seem” to lack clarity, focus, drive and determination is because they simply lack specific, measurable, actionable goals AND the structured support systems and positive reminders necessary to follow them to fruition. Neither of us are right or wrong, we both need some form of structure and support, but for different reasons. No matter what your personality style is, the odds for staying on a constant upward spiral to barrel racing success is more likely if you do too! There’s a second BIG reason why I believe we get motivated and then our internal sparks slowly die down into smoldering embers where flames once existed. Which is that we may have weak areas in our physical, mental or emotional foundations. You’ll notice that I haven’t even begun to talk about what we do with our horses in the arena. That’s because there’s a lot of inner work that must be done before our outer work even has a chance to create the positive results we’re after. The inner issues aren’t always the most obvious, which is why I feel it’s important to call attention to them. Often our motivation and consistency seems to ebb and flow because we’re simply not intentional enough about getting UP and staying UP! When I say UP, I mean at our best – on ALL levels. The quality of what you put out matches the quality of what you take in. This means your thinking, your words, the company you keep, the foods you eat, the music you listen to, the ways in which you spend your time, etc. Do YOU have habits established for how you live your life that help you to FEEL GOOD about yourself and your life – across the board? 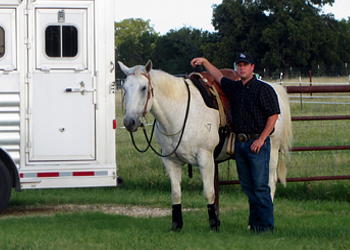 This Reserve World Champion uses SYSTEMS to stay focused & reach his goals. Because, when you FEEL GOOD – you’ll DO GOOD! Having mental and physical energy and a positive attitude doesn’t just happen to people who are “lucky.” Reading a couple personal development books per year won’t get you UP and keep you there, just like a two month gym membership won’t build strength and maintain fitness. This is something we ALL have to be conscious of and purposeful about every single day – always keeping our antenna up for perceiving how what we do and say affects who we are, how we FEEL, how we show up in the world, and how we clock in a run. So often people point to the horse or the ground conditions – they’ll pick things apart and find fault in ALL the typical places, but end up totally blind to the fact that they’re losing every day in a million little ways before they ever show up to the barrel race. Winners possess a heightened degree self-awareness for recognizing what’s holding them back, and a willingness to release what doesn’t work. My point here is that it’s critical to take intentional action every day to be at your best rather than resorting to auto-pilot. At the same time, if you’re truly holding up your part of the deal and still not feeling and doing great – with as much tenacity as you can muster, keep searching, keep asking questions, keep digging until you find answers. The same goes for our horses. We can’t bring out their greatest potential if we just “let” things happen – we must intentionally cause and allow instead (there’s a difference). Be purposeful about doing the work, and when a roadblock appears – be honest, be brave, dig deeper, face the fear, and seek the truth at it’s source to dissolve that barrier. Lastly, I’m going to dive into a third of four all too common roadblocks, which is poor management OF, and a poor relationship TO time. But we ALL have the same 24 hours in a day. And while we don’t all have equal talent and resources, etc. I know of plenty of people who have been able to utilize their time well, even without these things only to reach higher levels of success much quicker than those who do. When we finally get to the point where we’re ready to give up the fight for “time” and claim NO CONTEST, we realize that there was really nothing to fight over. We accept that being a champion at anything can take YEARS, and while an inner knowing that our days and years ARE numbered (which should create some sense of urgency), we also realize that cramming too much into each day, and the negative emotions that result when we do, is NOT the fastest way to help our barrel racing dreams materialize. When we’re motivated to achieve success for the right reasons, we come to terms with the fact that our dreams may not happen today or tomorrow, but will happen IF we stick to the course day by day. There’s a great deal of contentment in that. What you resist, persists. When you’re unaccepting of the “lack of time” you seem to have, somehow you’ll end up with even less of it. When you keep fretting over it, saying out loud or to yourself, “I don’t have TIME!” you only invest even more in the frustrating cycle rather than seeking real solutions. Time, like money, isn’t good or bad – it’s what we make of it. And our feelings toward it, especially a fear of lack, will certainly effect how much we enjoy, or don’t enjoy. Instead release, prioritize, streamline, and be realistic about what it’s going to take to get to where you want to go and commit to honoring your dreams by making the time they’ll require a top priority rather than an afterthought, or dedicating only whatever time is left over in what is most likely an already over-booked schedule. Your dreams deserve more than leftovers! While it’s true that you can’t always do everything, you can always do something. Put in the time, use it to the best of your ability, drop what’s not important, and the results will come. Winning happens long before you load up for the barrel race. Not necessarily in your time, but in the right time. 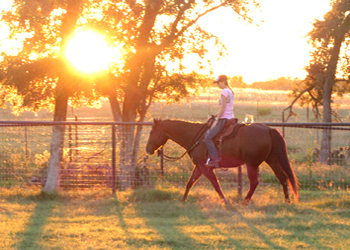 There’s peace in that, and a peaceful, unrushed heart and mind is so much more able to effectively connect and communicate with horses – and those little, seemingly insignificant everyday wins are what REALLY add up in the long run. 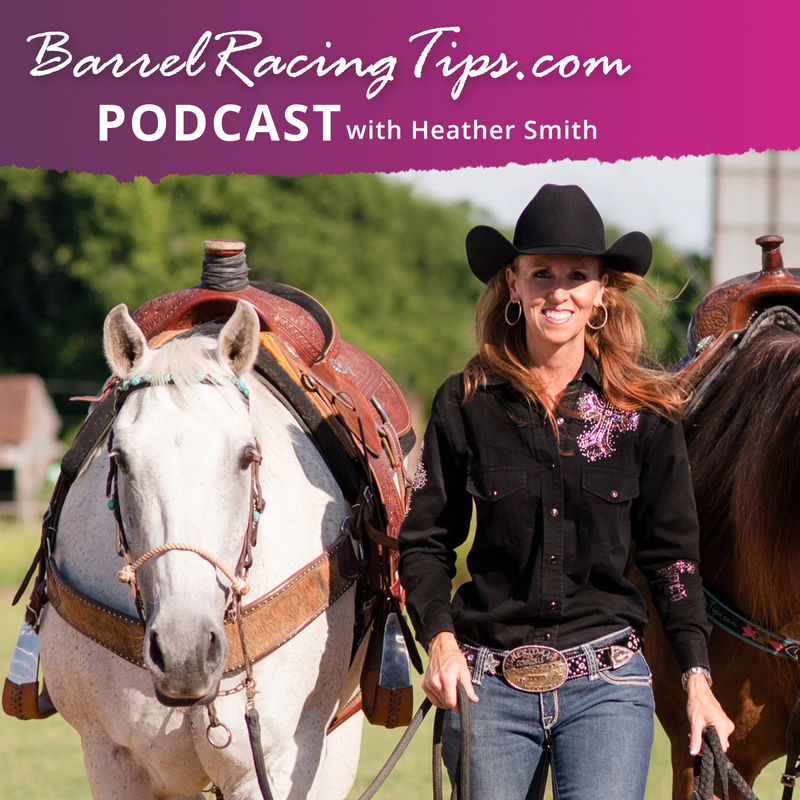 Next week, I’ll be sharing a special Pro Members-only video post with more specifics about the type of baseline we all need to establish in preparation for making the next barrel racing season the best one ever! I’d love for you to join me as we prepare this foundation, and in next week’s video I’ll be sharing with you the personal details that have and will continue to make my own success, and yours possible. Later this month you can also look forward to much more content specifically dedicated to the FOURTH barrier – which is poor management OF, and relationship TO MONEY! Financial limitations is such a big one, and so seldomly addressed that I’ll be specifically focusing on funding your barrel racing dreams over the course of two full posts! Create a structural system of support – a plan & reminders to keep you on track. Develop a strong physical, mental and emotional foundation. FEEL GOOD = DO GOOD! MONEY (more on that soon in the new BarrelRacingTips.com Pro Membership)! 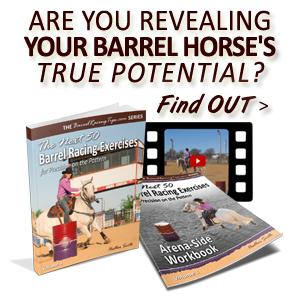 Remember, the first step toward positive change is awareness – what are the barriers holding YOU back from achieving your barrel racing goals? What inner AND outer work will you start doing to dissolve them going forward? Let me know in the comments below! Five Powerful Tips for Turning a Setback into a Comeback! Discover and Develop the Horse Power You Need to Succeed! 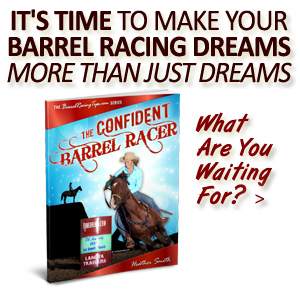 Are Time, Energy & Money Parasites Stealing Your Barrel Racing Dreams? How to Plan Your Peak for a Winning Warm-Up and a Winning Run! I am finding that my main barrier is time. When I get home I have 4 horses to ride/work, yet I would like to make healthy meals for my family and not (much to my kids’ and husband’s dismay) eat fast food or pizza…because it DOES make a difference in how I feel and perform. We have a lighted arena, which helps a lot, but what suggestions do you have for this area? Any “quick healthy meal ideas?” I try to have my daughter help work the horses and she does fine to just get them out- but sometimes there are fine tuning things that we need to work on that she can’t do. (She is 10.) I try to alternate 2 horses “working” and 2 horses just getting “out” so its not so limiting…but I feel like I am not getting the drills or skills in that I need- or we end up eating dinner at 8pm. Help! Yes, Nikki, I do have some ideas, and you’re not alone! 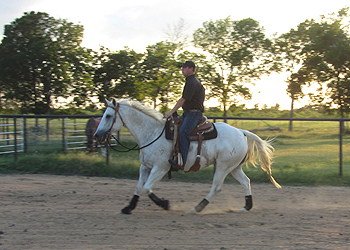 I have really struggled in this area too and so years ago Craig and I made a rule for ourselves – four horses is our limit between both of us. So that’s an area to think about. We are often in “training mode” even with our aged horses, so there’s much more than exercising going on, which takes TIME. One more thing I wanted to add it that it’s on my list to get a small, used four-horse hot walker. Something I can use when I bring the horses in to have them handy, ready and a little physically warmed up to make the transition from horse to horse quicker – especially in times when we need to “beat the heat!” I’d rather have them just taking a leisurely walk as they wait their turn vs. standing tied for a couple hours (this ins’t all bad especially for young horses, but not something I want to do regularly). Right now my main barrier is MONEY (for everything that is barrel racing related). Can’t wait to read more about it! I’m alwas thankfull for your effort to help others! Thanks again! You are so sweet! God bless you! Thanks Roberta, it’s my pleasure to help – looking forward to blasting through those money blocks! One of my roadblocks is definitely time — I leave the house at 4:30 a.m. and don’t get home until 7:00 p.m. and no indoor place to ride..it’s dark when I get home now. I actually set up two camping lanterns on top of two barrels for lighting to see if it would work — not so much…LOL I am left with pretty much Saturday and Sunday…which I do make riding a priority on these days…I have learned to dress for the Midwestern winters and do ride as long as it is not icy. But I think one of my main issues is really having a true support system and plan/attainable goals and how to get there. I know this part will take some real thought and soul searching but I am looking forward to learning from your knowledge to finally go after what has been eluding me for years. Hi Nancy, WOW – that is a killer schedule! I feel there is always “inner and outer” work and considerations to take. 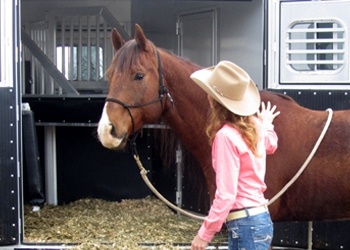 What must happen in order to allow you more time at home with your horses? It might be a major change, but it might not… for example, could you negotiate your work schedule? I used to work longer days and took Friday afternoons off… and in the winter I took long lunches twice a week so I could drive home to have daylight time with my horses. Get creative and be willing to say “No more!” to whatever is not working. I definitely admire your resourcefulness with the lanterns – that tells me you’re willing to think outside the box – good job! I have a good feeling that a solution will work itself out! I do have an alternative work schedule on Thursday and Friday, but because of my commute from the City back home, it will still be dark this time of year (in the next few weeks when we set the clocks back). I have made my peace with this for now as I cannot do anything else with respect to work…I am still trying to figure out lighting in some other way though…LOL. My mare was really good though tacking up and working by lantern — I could tell she was unsure about it but she did trust me enough to work through it with me — love that mare! I have not lost sight over the years of my dream and what I want to accomplish but know it will just take me a little longer to get there. I made huge strides this summer when I was able to work with my mare 4x a week so I do feel good about that. Gaining the knowledge for what is to come with respect to a plan, mapping things out is something I am looking forward to and can work on during the Fall/Winter so when Spring comes, I’m better prepared to move even further. can you give us the model you use for your structural support. The systems you use? Last year I decided I’d had enough! Always on the edge, but never getting over it. I packed up the house, 2 horses, a dog, my 8 year old son, and moved from WA to OK. It’s been a lot more bumpy than we envisioned, but I signed on a house and property Monday, and a guy with a tractor and disk come out next week. And I am not dreading the winter, knowing I’ll be hiding in the house for 6 months! My schedule is centered around the school day, so I’m usually home by 3:30-4:00, which leaves daylight. And I’m working REAL hard at driving right past the house and heading straight to the barn. It is SO easy to get caught up in stuff at the house and next you know the daylight is gone! I love the frozen crockpot and make ahead dinners idea you mentioned in one comment. 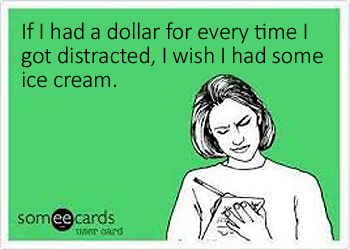 I am so adding that to my time management! And really look forward to your ideas on money. As a single mom, I pinch and stretch every penny!! I had to laugh at your article, because I, too, get super focused on what I’m doing and neglect everything and everyone else. It’s almost irritating to be reminded that I need to eat. Time management is definitely my biggest thing, trying to do too much or getting hyper focused on just one thing. I’ve come tr rely real heavy on the calendar app on my phone to beep at me through the day and break my concentration and remind me to be more thoughtful of my time. Looking forward to next week’s article! Hello, I have a 6 yr old that will not finish his second can at high speeds. I am out of exercises. He wants ti get heavy in my hand and go his way not where I point him. I have worked slow no cans just lines, circles, moving hips, shoulders, lifting, bending. But when he gets running its his way and will not respond and blows is second can. What can I do. I have video to. 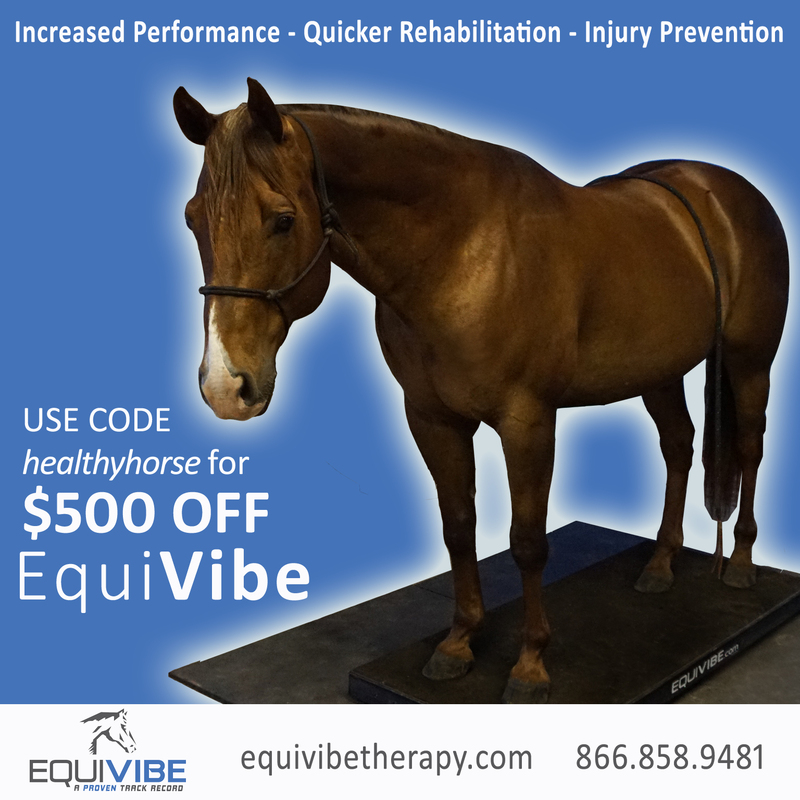 You’ll want to be sure you’ve ruled out physical problems, but it sounds to me as though your horse isn’t taking responsibility for the turn and staying on track. I’ll post a couple resources below, but a Power Hour coaching session might be the perfect option to move past this once and for all! 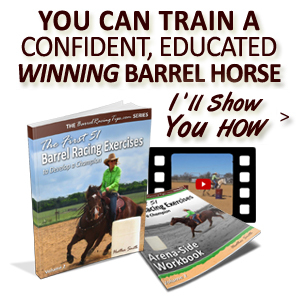 How to Give Up Micromanaging and GAIN a Horse that LOVES Barrel Racing! I have always maintained my own small breeding program that allows me to breed lines I like and fit me. I have up and coming horses to train and like to dabble in futurities. But now that the kids are grown and gone I really don’t have lots of help at home when I’m on the road, I need to reduce my herd. Very hard to do. I have a few old timers that are pasture ornaments, they have put in their time. They are definitely a financial drain but are no longer sound. Then there are the up and coming youngsters who are so promising and I love training almost as much as competing. I know I need to make a change to be able to be on the road more but I seem to stay stuck. I need more help and more money. I understand, that is a tough place to be in but we’ve had a “quality over quantity” theme for a few years and I really resonate with it. We have three horses right now – all aged geldings who have some manageable pathologies, and we just keep doing the best we can with what we’ve got because we’re not in a position to give them the life they deserve PLUS bring along and haul youngsters (even though I LOVE starting babies) so at this point we continue to refine and maintain our existing boys. It feels good to keep it simple and they still have a lot of life to live and lessons to teach! You might enjoy this post on life balance, also see the link to the “Joy of Less” book linked at the bottom.